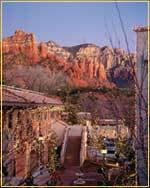 Diamond Resorts International® appreciates and values our role in the Sedona community. We recognize that Red Rock Fantasy has been a big part of the community for 22 years. However, the homeowners association for Los Abrigados can no longer absorb the full cost of this event as it has done in the past. We have offered to provide the naming right for the event, and help defray the costs working for any city or community partner who would like to create a holiday light festival. Diamond Resorts has also committed to providing financial support to the Sedona community by contributing to the City of Sedona’s 4th of July laser show last year, this year and for years to come. We look forward to our continued participation in the Sedona community. Nestled within the world-renowned red rocks of Sedona, Red Rock Fantasy is a festival of nearly one million lights providing a man-made marvel within the scenic beauty that has drawn visitors for the past one hundred years. 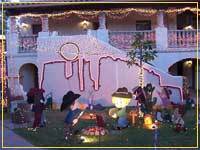 Now in its twenty first year and boasting over two dozen displays created by families from the Southwest, the festival promises never before seen marvels of light that leave children in wonderment and move adult minds to enjoy the holidays as they did when they were young. It is a magic that can bring cartoon favorites to life, challenge children to scavenger hunts within the displays, or illuminate an undersea adventure. 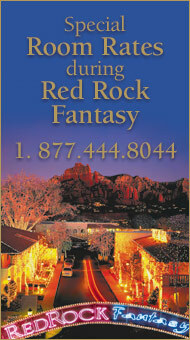 That is the magic that has made Red Rock Fantasy a favorite among residents and visitors alike. Each year, Red Rock Fantasy has dozens of displays to dazzle our guests. Opening Ceremony for the 22nd Annual Red Rock Fantasy will take place this year at 5:00 p.m. on Thursday, November 15, 2012. The event will last through the season. The festival is open each evening (weather permitting) from 5:00 p.m. to 10:00 p.m. on Fridays and Saturdays and 5:00 p.m. to 9:00 p.m. Sunday through Thursday. Admission prices are $5 for adults, $4 for seniors, $2 for children aged 5-12 and complimentary for children 4 and under. Blocks of 20 tickets or more are sold at a discounted rate of $4 per person. For more information call 1.877.444.8044 or 1.928.282.1777. Visitors are not, however, the only ones who are touched by Red Rock Fantasy. The event benefits its hometown, local charities, and dozens of families each year. Proceeds from the event have been earmarked for charity since its inception, providing tens of thousands of dollars to organizations such as Boys and Girls Clubs of Northern Arizona and Verde Valley Sanctuary. Last year there were 24 awe-inspiring displays vying for prizes ranging from vacation stays to 46" flat screen TVs and cash awards. The record breaking attendance provided nearly two dozen regional, non-profit organizations with approximately $10,000 in donations. Thank you to all who participate in this annual charity event. © Copyright 2012 Diamond Resorts Holdings, LLC. All rights reserved.